The cards featured here are 1954 Topps. Larry Doby (on the right) was the second (1st in the AL) african-american to play on the major league level. The only problem, with this otherwise flawless set, is the cards are too big for card protector sheets. Too big for single, hard plastic protectors usually too. The 1955 Bowman and a few others, are also too long. This is why shoeboxes still come in handy. If you need a special place for those cards of beauty, sometimes nothing beats the protection of a shoebox. Next time out at the mall, don’t be shy—ask a store if they have any spare boxes. Kids’ shoeboxes are best. This amazin’ card is from Upper Deck as part of their series knows as, “Reflections”. That’s because the card itself is a kind of rainbow clear refractor. And the jersey-cut is fantastic, featuring a piece of an orange letter in there! There were 50 made and this is numbered 15. Gooden also signed the card to really increase its overall value! When Gooden came on the scene in the mid-80’s, he absolutely dominated. Batters couldn’t figure out how to hit his curve. His slider. His fastball! I had the great fortune of seeing him pitch live at Shea Stadium with my pop, and let me tell everyone reading: the guy theee lightening! Today, his signed items tend to fetch more than his cards. But this is only because he’s from that era of overproduction and printing mayhem. I can still recall the fever, which everyone had, seeking his 1984 Topps Traded rookie card at shows! 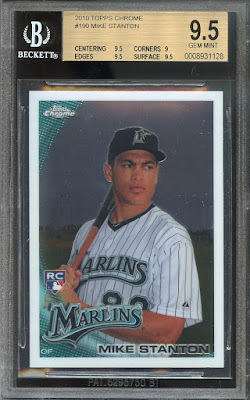 The 84 Topps Traded Tiffany in Mt condition, non-pro graded, goes for $50. Whereas a signed photo of ball might catch twice this amount. Either way? He was a wonderful pitcher whose career shouldn’t be overlooked by any means. It’s true: older baseball cards continue to gain value. 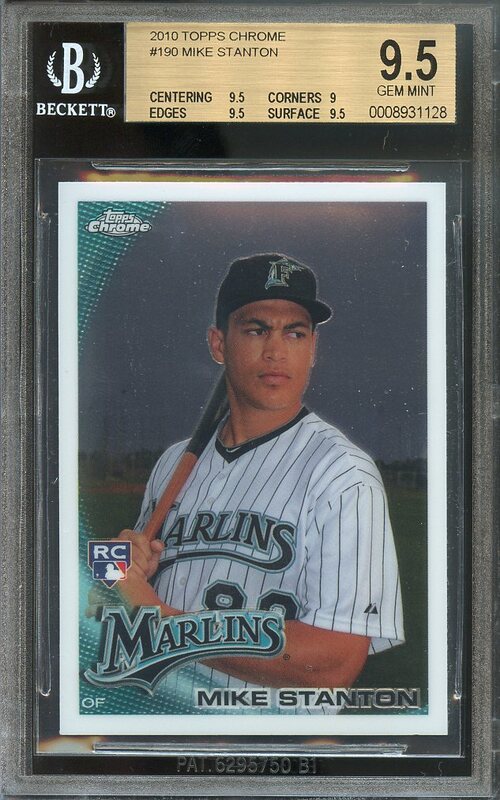 The long-term investment potential for many older cards and memorabilia in general, is valid and real. Cards like this Roy Campanella, 1955 Bowman are riding quietly. The card pictured in its present state, is valued at $150. Ungraded older cards are starting to catch fire as well. Affordability has always played a role in this hobby industry. So if there’s ever opportunity to snag a card that’s not professionally graded, take it! How much impact can one rookie have on their team? Just ask the 2017 Yankees who have, time and again, relied on Aaron Judge’s talents to take them the extra mile! This season, we’ve seen his cards jump in price. His autographed cards are easily over $500. This 2013 Leaf RIZE EMERGENCE Judge rookie is starting to heat up as the hobby searches for any and all Judge material/items. After all, the kid made setting the rookie record for most HR in a season, look extremely easy! Yes, that's right: Giancarlo (Mike) Stanton just hit 59 home runs in 2017. As of writing this, he's 27 years old, soon to turn 28 next month, November 8th. 27-hey, isn't that the "rockstar death" age? Well, there seems nothing that morbid or dark happening in Giancarlo's life other than not making the postseason again and oh yes-the absence of friend and co-player, Jose Fernandez. Jose would have entered this season at a mere 25 years of life. That horrible loss was only a year ago, September 26th. Was his loss what kept Stanton blasting away all year? What inspired him most? Jeter and the rest of Marlins brass will have the task of figuring out what to do with Stanton. I mean...obviously, you keep him, right? Who in their right mind wouldn't? In eight years, Stanton has a .268 average with 267 home runs. Shower us with 672 runs batted in and a lovely 576 runs scored. This is why this card over here, is starting to creep up in value at $120 (but only when in this condition (8.5-10) and when graded). Some of his other rookie cards are starting to jump up in price too. Obviously, the time is right to invest in Stanton. Thing is, it was always the right time.